They demolished Mrs Flannagan’s house last week. One day I drove by and it was just gone — replaced by scaffolding and heavy machinery. 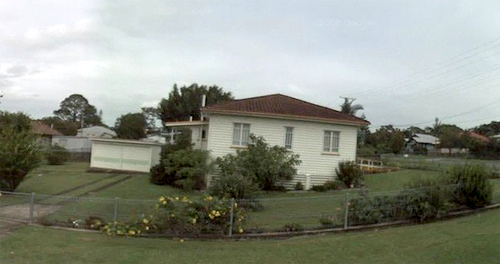 This is what Mrs F's house looked like (thanks to Google's street view). Her wooden post-war house sat on the corner of two prominent roads leading to the town centre, and I’ve been passing it almost daily for the last ten years. And each time I rounded the corner, I would admire Mrs Flannagan’s garden, which marked the passing seasons with a rainbow of colours. Scarlet poinsettia in winter. Purple pansies in the spring. Power-blue plumbago in summer and orange cosmos in autumn. Orange cosmos at David's parents' house. Occasionally I saw Mrs F working in the garden. She was obviously elderly, with a stooped gait and cotton-wool hair. Sometimes she used a walking stick to support her short excursions into the sun. After a couple of years, I noticed a new addition to the front of the weatherboard house. A gently-sloping ramp had been constructed to bypass the front steps that led to the main entrance. A bed of annual was carefully planted alongside the ramp — spots of colour to disguise the concession to poor health. One weekend as I drove by, I could see Mrs F’s extended family working together to trim the lawn, weed and mulch the flower beds. Mrs F sat in the shade with a walker beside her, supervising the work. For a while longer, her garden bloomed with regularity. 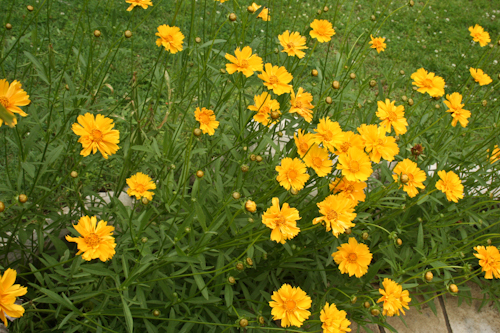 However, annuals were no longer being planted and then cosmos turned wild — self-seeding in generous amounts. Then a For Sale sign was planted in the garden. Being in such a prominent location, the house changed hands quickly. Renters moved in — obvious by their minimal garden care and the addition of a swing-set and ride-on toys to the backyard. They left the once-immaculate grass littered with plastic toys and hung a variety of kids’ clothes on the rotary clothesline. The garden slowly faded into obscurity. Bushes were removed. Garden beds flattened. But still the cosmos appeared — bursting forth with cheerful colour when it was least expected. But now a scaffolding stands where Mrs F’s house stood for seventy years. Cement trucks are pumping concrete into the foundations. And this is her house-block today. You can't stop progress. I missed the demolition and so I have no closure with the old house. Was it taken away to live on another plot of land, or was it knocked down without remorse? 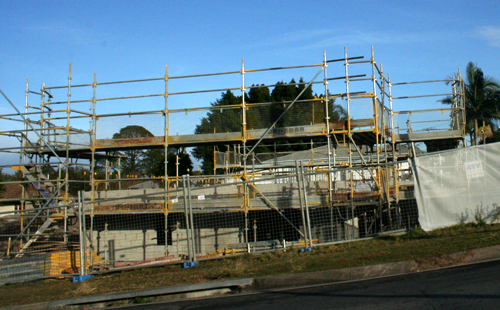 It looks like the builders are constructing townhouses on the site. More high-density housing at the expense of backyard lawn and gardens. Development is necessary and despicable at the same time. I’m sad to witness this “progress”, although I know it means an increase in “affordable” housing in commutable distance to the city. The over-development of this area and the ingrown dependence on fossil fuels is what makes us despise the suburbs. We want to take our kids away from this place, so they know where the food they eat comes from. Where we don’t have to burn petrol before we can hang out with friends. My voyeuristic memories of Mrs F are now all that’s left of the old house, for it looks like it’s finally the end of the cosmos. What a touching story, its so sad to see the changes that take place for the worst in our communities. I feel this way too when I see the pretty, old houses and buildings torn down and replaced with some modern thing. Or a stretch of forest taken out and replaced by apartments. You told this story so well. I love what you said about wanting your kids to know where the food they eat comes from. Awww…so sad. However, I heart this post!! Ever read The Little House by Virginia Burton to the girls? If that is the house I am thinking of then no it didn’t get moved :-( They bagged up heaps of asbestos when they demolished it so I guess it might have been too risky?